Chances are, “on the job” is your first response — even though formal courses and programs make up most of your “official” development. And the move to virtual or technology-driven learning — “blended learning” — isn’t changing the leadership development equation as much it seems. True blended learning isn’t merely mixing classroom and virtual training events. Instead, it’s a combination of formal learning combined with workplace-based or “informal” learning opportunities, addressing all segments of the 70-20-10 rule. 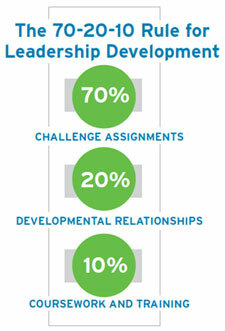 The 70-20-10 rule emerged from 30 years of CCL’s Lessons of Experience research, which explores how executives learn, grow and change over the course of their careers. This rule suggests that successful leaders learn within three clusters of experience: challenging assignments (70 percent), developmental relationships (20 percent), and coursework and training (10 percent). Many organizations embrace blended learning, which is typically defined as a combination of traditional classroom-based training with some form of virtual learning like eLearning modules, Webinars or virtual classroom events. However, many of these blended learning programs — classroom or virtual — still fall into the 10 percent “coursework and training” cluster: a sequence of activities designed by a trainer to achieve specific learning objectives. While the on-demand or flexible elements are certainly more convenient to the learner — and often less expensive for the training department — traditional blended learning solutions often leave the critical 90 percent of leadership development experiences untouched. Even when organizations acknowledge that formal training alone can be limited in impact, they struggle with how to systemize and evaluate a learning strategy that also includes experiences (70 percent) and relationships (20 percent). Feedback: Honest feedback is critical to performance improvement yet difficult to obtain and give. Tools and job aids for delivering (and receiving) effective feedback can be brought back from the classroom to the workplace team. Apps and mobile learning: Apps are now embedded in the flow of our lives, and are arguably the No. 1 learning tool used outside the workplace. Apps for leadership include performance support tools and job aids, learning “nuggets” and quick reminders, and effective examples that can be summoned up in a moment. Social media: Social media is all about connectedness. And aside from self-awareness, it’s difficult to think of a leadership skill that doesn’t tie directly or indirectly to connectedness. In an increasingly virtual world you can’t neglect this channel for leadership. MOOCs: The size and global scope of a Massively Open Online Course (MOOC) offers the opportunity to explore and question cultural ideals of leadership, to engage in peer learning on a massive scale and to experiment with behavior change in the workplace. Thus, feedback can be provided and adjustment made while the course is still underway. CCL’s first MOOC will be available for enrollment in September 2013. Lessons of Experience: CCL has decades of research and analysis of the types of experiences that create great leaders — as well as the derailers that keep people from reaching their potential. Embedding this knowledge into the workplace, working with bosses, coaches and mentors on project and career path decisions, and proactively cultivating key relationships ensures that these lessons won’t be lost on the next generation of leaders. Action Learning: Action learning projects are real work; at the same time, they are opportunities for reflection, coaching, practice, and discussion of leadership skills and what it takes to be effective in the actual job environment. The way leaders learn will change dramatically in the next few years. One thing we see is that blended learning for leadership will be remixed. It won’t be just about technology or mixing classroom with online experiences or the latest trends that promise to transform learning forever. It will be about building, in a thoughtful, systematic way, a structure to enable and support how leaders learn best. This article is adapted from a new CCL white paper: Blended Learning for Leadership: The CCL Approach. You may also want to read Who’s afraid of blended learning?, a series of three Leading Effectively blog posts, and let us know what the leadership development mix might look like for you.